Yes, you heard it right.. The batter is made with beer instead of water. You get such crispiness in the coating. Do give it a try ! Corn flour .... 2 tbsps. Soy sauce ...... 1 tbsp. 1. Clean the prawns. Leave the tails intact. 2. Marinate them with garlic paste, soy sauce, ajinomoto and salt. 3. Make a thick batter with the flours adding salt and beer to mix. 4. 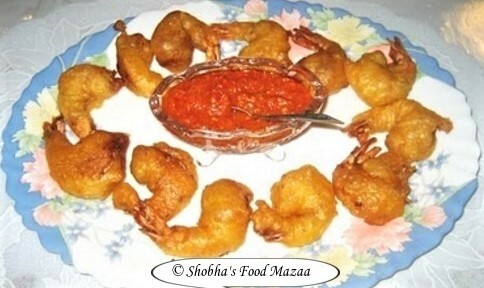 Just before serving dip the prawns in the batter and deep fry them. I wish i could grab that plate from my screen. looks so delicious!!! glad to follow your blog .. It is really nice to see all the tasty and yummy recipes in each others blogs...we get to learn something new.